BBC NEWS | UK | Who swears oaths in today's UK? A report recommends school leavers should be asked to swear an oath of allegiance as part of proposals relating to British citizenship. But who else has to swear oaths in modern Britain? 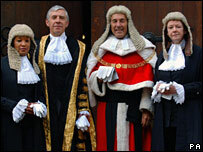 For most people, the first image which comes to mind upon mention of oaths is a court. Witnesses, and occasionally defendants, must swear on oath the answers they give to questions asked in court will be "the truth, the whole truth, and nothing but the truth". But there are others who have had to swear an oath to fulfil their roles in life. Oaths of allegiance are sworn by the judges and magistrates who preside over the courts. These are oaths of office, and are sworn only once, at a swearing-in ceremony. As with all oaths, they are sworn to God. For the non-religious, there is the option to "solemnly declare and affirm". 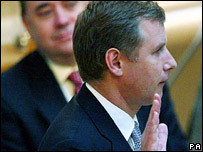 With each new parliament, following a general election, all members must take the oath of allegiance, or else affirm. Because there are hundreds of MPs, this can take days, although it takes less time in the smaller Scottish parliament and the Welsh assembly. The oath includes the line: "I shall be faithful and bear true allegiance to her Majesty Queen Elizabeth". In all three assemblies, there is a minority of republican members who make it clear they take it under protest, in order to be able to represent their constituents. "Can I make it clear that I believe in the sovereignty of the people of Scotland rather than a monarch", Dennis Canavan MSP said at his swearing in, when the Scottish Parliament was re-established in 1999. In Northern Ireland, more account has been taken of republican objections. Members of the Assembly merely have to sign the Roll of Membership. Not all members of the armed forces have to swear an oath of allegiance, but clearly this is no reflection of differing loyalties. The Royal Navy is the oldest of the three services, and it was established by the sovereign's prerogative. For that reason, recruits have never been required to swear allegiance, but they do sign an attestation or engagement form on entry. The same applies to the Royal Marines. 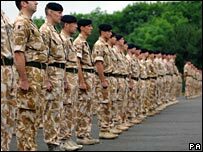 For the rest of the armed forces, including the British Army and the Royal Air Force, the oath includes swearing to God "that I will be faithful and bear true allegiance to Her Majesty Queen Elizabeth the Second, her heirs and successors and that I will, as in duty bound, honestly and faithfully defend Her Majesty". Those with no religious belief can "solemnly, sincerely and truly declare and affirm." The oath which police officers take on appointment is similar, but with references to property, the people and keeping the peace also present. It includes the pledge: "I will, to the best of my power, cause the peace to be kept and preserved and prevent all offences against people and property; and that while I continue to hold the said office I will, to the best of my skill and knowledge, discharge all the duties thereof faithfully according to law." Members of the medical profession are widely believed to take a Hippocratic Oath (named after the Greek physician Hippocrates), but this is no longer the case. In fact, they simply agree to abide by the principles of good medical practice, as defined by the General Medical Council. "On my honour, I promise that I will do my best To do my duty to God and to The Queen, To help other people And to keep the Scout Law." 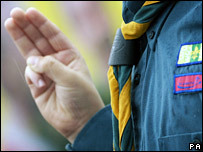 The Girl Guides' oath is almost the same, with minor variations such as promising to love God, rather than just do one's duty to Him. There is no option to affirm in the Scouts, because religion (not necessarily a Christian one) is a prerequisite for membership. Interestingly, as in the Northern Ireland Assembly, it is allegiance to the Queen which presents a problem for some, in this case because she is the head of the Church of England. 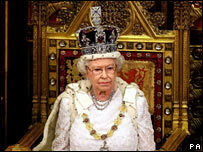 Non-Protestant Scouts may substitute "the country in which I live" for the Queen. This is also the version of the Promise used by non-British citizens who are members of Scout troops in the UK.